Top Rated Dallas Paintless Dent Repair Company! We offer our industry leading Auto Hail Repair and Paintless Dent Repair services to all impacted vehicles in Rockwall and Rowlett. If your vehicle is dented and dinged all over from the Rockwall/Rowlett 4/6/18 hail storm, give us a call to experience Hassle-Free Auto Hail Repair. All we do is hail and we do it well! We can handle all items damaged in the hail storm, no matter how minor or severe the damage. Do not take your hail damaged vehicle to a local dealership or local body shop for repair. If you choose to have a local dealership or body shop do your repairs, you will be dealing with the middle man as they will sub-contract out your paintless dent repair to an outside hail repair company like us. We are not a generalist body shop as we only repair complete hail damaged vehicles with full coverage insurance. We are a true specialty body shop that is focused 100% on hail damaged vehicles. Avoid extreme repairs and tons of body filler and give us a call to experience what a true hail damage repair company is! We are conveniently located in Rowlett near Highway 66 & President George Bush Turnpike. We proudly serve all Rockwall and Rowlett residents needing Auto Hail Damage Repair. The April 6, 2018 hail storm that impacted Rockwall and Rowlett was severe. We are seeing most vehicles damaged in the storm with around $5,000 or more of damage. Our Rowlett and Dallas repair shops are ready to take your hail damaged vehicle in for repair today! Do not trust your repair to an out of town company. We were here before the storm and will be here after the storm. If you choose us for your Auto Hail Repair needs, you will receive industry leading repairs from a specialty body shop that focuses 100% on Auto Hail Repair. All we do is hail and we do it well! Give us a call today to get your vehicle on the way to being dent free once again! The Dallas-Fort Worth Metroplex usually is impacted by hail storms in April or May. If you find your vehicle dented all over from a hail storm, allow us to properly repair your vehicle. Vehicle owners from all around the Dallas-Fort Worth Metroplex choose us to repair their hail damaged vehicles because our process is Hassle-Free. If you live in Dallas, Mesquite, Garland, Rowlett, Rockwall, Wylie, Sachse, Murphy, Plano, Allen, McKinney, Frisco, Addison, Irving, Arlington, Richardson or surround areas, do youself a favor and choose us for your Auto Hail Repair needs! All we do is hail and we do it well! Why Choose Us For Your Auto Hail Repair Needs? Do not take your hail damaged vehicle to a “generalist shop” that will replace panels with cheap aftermarket parts and wipe large amounts of body filler all over your vehicle’s exterior. 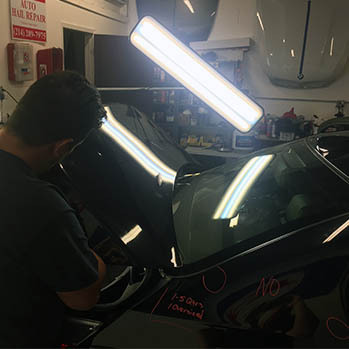 Although there are limitations with Paintless Dent Repair, an auto hail damage specialist shop like us can save many panels from being replaced. We treat every repair as if it is our personal vehicle and make repair decisions based on that. We try to minimize extreme repair methods as much as we can and retain the original parts and paint on our customer vehicles. If your hail damage is beyond the limits of PDR, we can handle all the conventional paint and body repair methods as well. If you live in the Dallas-Fort Worth Metroplex, allow us to properly repair your hail damaged vehicle with Paintless Dent Repair. We PDR 1st and replace and paint 2nd! PDR has continually improved over the years since being introduced to the United States in the late 1980’s. The tools used are no longer bent screwdrivers and homemade tools but are high-quality precision cut tools offered for sale from major PDR tool manufacturers. A complete set of tools for one PDR technician can easily cost upwards of $6,000. The quality and efficiency of Paintless Dent Repair has changed the mindset of insurance companies. The days of insurance companies writing up hail damaged vehicles as conventional paint & body is gone. Insurance companies choose Paintless Dent Repair as the preferred method of repair for hail damaged vehicles for many reasons. Paintless Dent Repair is environmentally friendly, requires no body fillers, no paint and the repair time is drastically reduced when compared to conventional paint & body techniques. 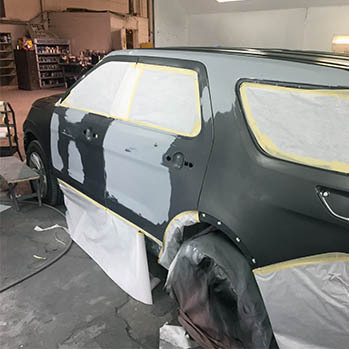 When given the choice, customers also prefer Paintless Dent Repair because there is no risk of paint overspray, improper color matching and the integrity of the OEM seams and welds are not effected. 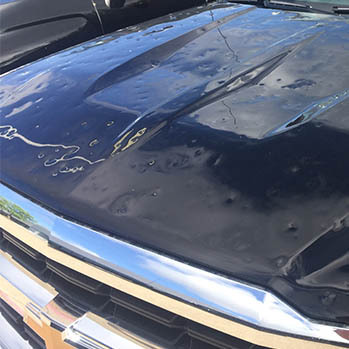 If you find your vehicle damaged from a hail storm do not hesitate to give us a call. We specialize in hail damaged vehicles and are experts in Paintless Dent Repair. We are a specialty auto body shop focusing 100% on Auto Hail Repair. If you live in the Dallas-Fort Worth Metroplex allow us to show you Hassle-Free Auto Hail Repair. We offer a comprehensive list of hail damage repair services to repair all vehicles damaged in hail storms, no matter how minor or severe the damage. We provide free vehicle pick up/delivery and waive most deductibles for our customers. All we do is hail and we do it well! Thank you so much for saving my insurance deductible and fixing my Altima after the recent hail storm. I was at work when the storm came and could only think that it would be impossible for me to come up with $500 to pay my insurance deductible. You saved me $500 and repaired my car beautifully. When I got it back it was dent free and detailed! Thank you again for helping me out with the deductible and doing such a great repair. How Long Does Hail Repair Take? How is Paintless Dent Repair Different From Traditional Methods?